The NASA Atmospheric Tomography (ATom) mission is ramping up. 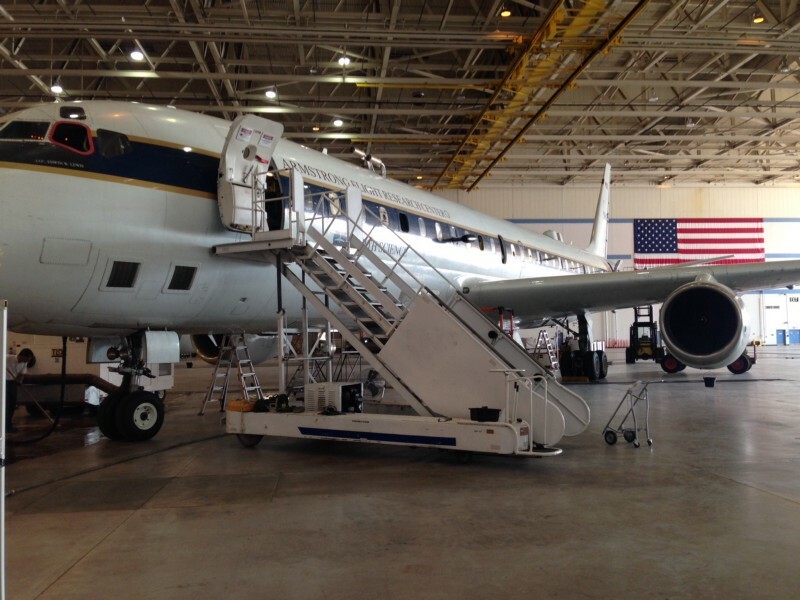 With only 9 days left until our first science flight, the instrument teams have been busy this last month installing their equipment on the NASA DC-8 in the hangar at the Armstrong Flight Research Center (AFRC) in Palmdale, California. Palmdale is located in the high desert of southern California, about an hour drive up over the mountain ridge from the Burbank (Bob Hope) Airport. Though a seemingly nondescript desert town, this area is no stranger to aviation and flight research. Palmdale itself is home to the notorious Lockheed Skunkworks, as well as a facility with the rather unassuming name “Air Force Plant 42”, which just so happens to build long-range stealth bombers. About a 30 minute drive north through the desert heat and sand is Edwards Air Force Base. Among other things, Edwards served as the back-up landing strip for the space shuttle program. The now-retired 747 shuttle carrier is casually parked next to the side of road along Avenue P in Palmdale…next to an SR-71 Blackbird, of course. The NASA AFRC hangar houses not only the DC-8, but also two ER-2’s (former U-2 spy planes turned high altitude research planes), a G-III, and a 747 named SOFIA that flies a massive telescope around the world. 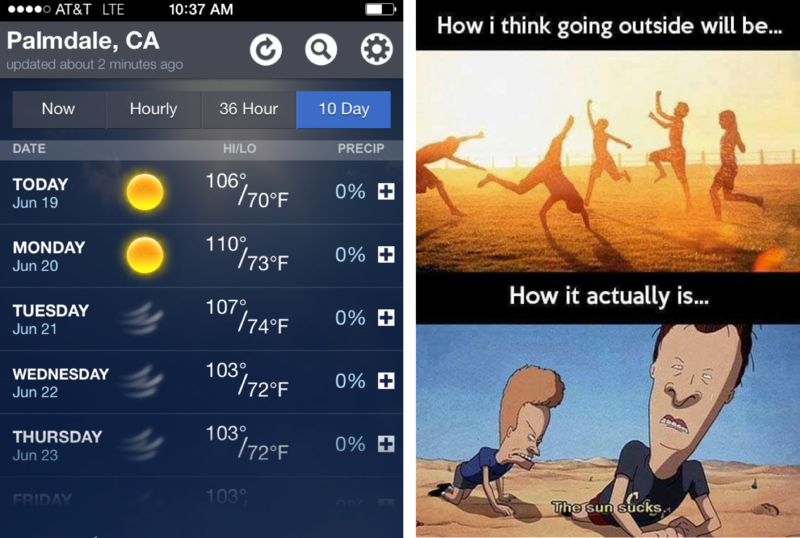 Palmdale (as noted above) is in the desert, and the desert in the dead of summer is HOT. My team arrived on June 18, and we were greeted by intense heat with temperatures well over 100°F; the kind of heat that makes you feel as though you will turn into a dehydrated and desiccated mummy if you’re outside for more than 30 seconds. On our first days at AFRC, there was confusion and delays in acquiring our door access badges, which at one point left a few of us stranded outside at midday desperately trying to get a hold of anybody inside to let us in before we all spontaneously combusted. Luckily, we found an open stairwell to duck into for temporary shelter. 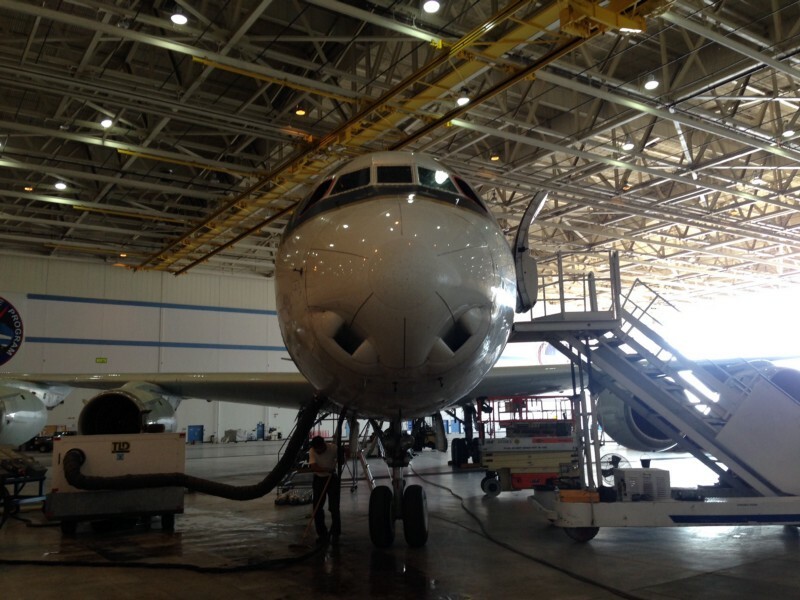 There is air conditioning piped into the DC-8, though in the heat of the day, even that can’t keep up. One of my colleagues, CIRES/NOAA scientist Karl Froyd, described the breezy days in Palmdale to be like “sticking your face in front of a hair dryer.” I couldn’t agree more. It’s best to become nocturnal if possible. Beavis and Butthead meme shamefully ripped from the internet. Credit to anonymous internet person. The first two weeks of our time in Palmdale was devoted to “integration”, or in other words, installing our instruments onto the plane. All of our instruments are built into aircraft-rated aluminum racks, which are then bolted to the floor. Once the instrument is in onboard and secured, all of the electrical cabling lines and gas plumbing lines are installed. My NOyO3 instrument (that measures nitrogen oxides and ozone) has a heavy duty dry scroll pump that is bolted to the floor directly forward of my instrument rack. It has the dual purpose of pulling ambient air into my instrument through inlets mounted in the window plate, and also throwing out enough noise and heat to sufficiently annoy Terrence, one of our flight technicians who is unfortunate enough to have a seat right next to it. As part of integration, we have a series of checks and tests to fulfill, including measuring the power draw of the instrument, calculating our rack “tip over moment”, and submitting documents on all of our temperature control and pressurized systems to the NASA engineers for approval. Work days in the hangar during integration are often long and arduous, as we normally arrived at 630–7 am and worked until about 6 pm. For two weeks straight. With only one day off. With such long work days in close quarters, irritations amongst colleagues can often occur. I quickly found out that eating regularly so as not to become “hangry” with low blood sugar was required for me to make it through the entire day. Likewise, my boss quickly found out that handing me a bag of Doritos before asking me to re-do the plumbing runs was highly effective. I am happy to report that integration of NOyO3 went smoothly and there were no casualties. A few candid shots of the NOAA/CIRES teams during Week 1 of integration. 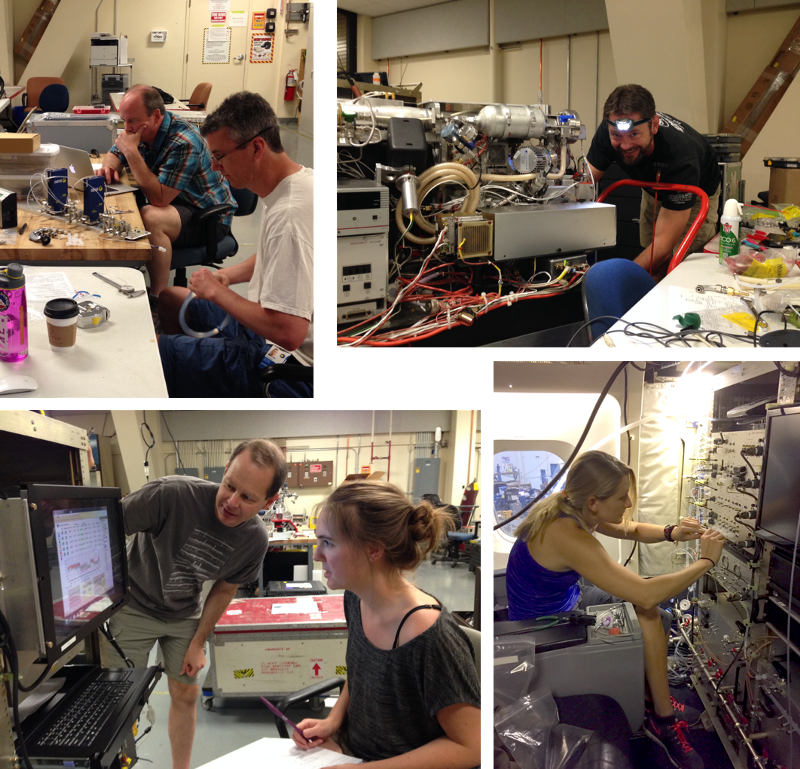 Clockwise from top right: Karl Froyd preparing the PALMS particle mass spectrometer in the lab, Chelsea Thompson (me) installing gas plumbing for NOyO3 on the aircraft, Chuck Brock & Christina Williamson testing the Aerosol Microphysical Properties instrument in the lab, and Tom Ryerson & Jeff Peischl working on the NOyO3 inlet plate in the lab. Our first test flight took place on July 12 and all instruments were operational. We had only a few minor glitches with communications between our instruments and the DC-8 systems that left us unable to feed things like altitude, latitude and longitude directly into our instrument computers, but these things will be worked out before mission deployment. Our 4 hour test flight took us out over the Pacific Ocean for some low altitude passes (~ 650 ft pressure altitude) and through the Central Valley of California to sample some more polluted air. We also performed a series of maneuvers (that can be gut-churning for some) to calibrate the wind probes that involved a series of pitches, yaws, and rolls. I would describe it as like a tame rollercoaster. All in all, it was a successful test flight. We now have one week to prepare for our second test flight on July 26, and then our first official science flight to kick-off the mission will be July 28. It’s sure to be an interesting summer. Stay tuned! 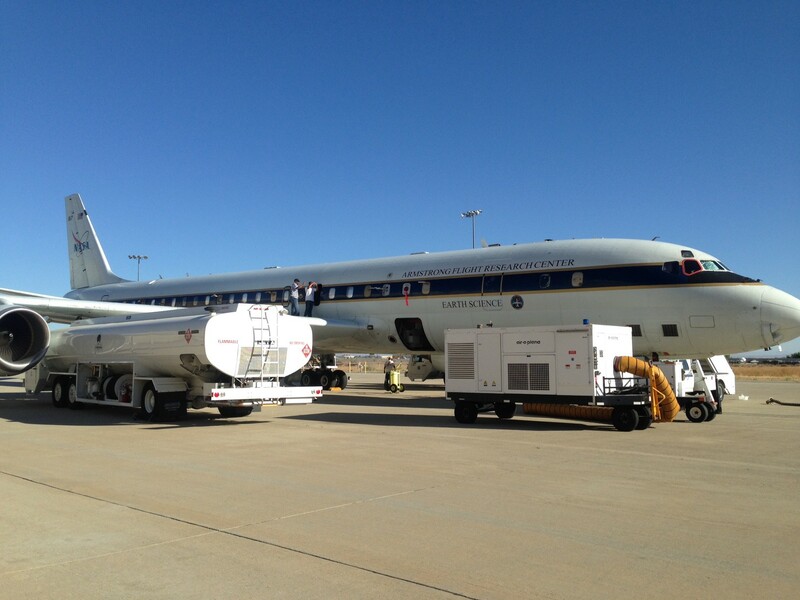 The DC-8 getting fueled and ready to go for test flight 1.